One of the most popular posts on this blog last year was the one about Bosco Verticale, two towers in Milan containing an amount of living trees equal to 10,000sqm of forest. Continuing the theme of greener building is a project from architects The Living for the courtyard of Manhattan’s Museum of Modern Art, New York. The ‘Hy-Fi’ structure is 100 per cent organic material. 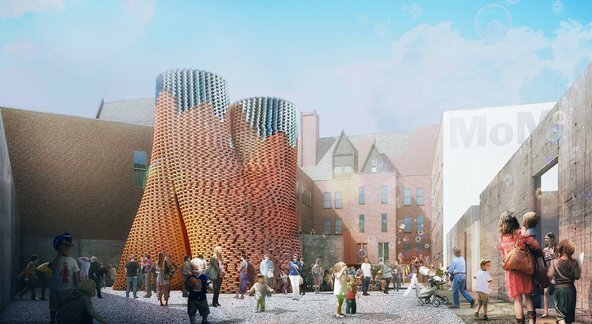 The embedded video explains how the structure uses bricks made from fungus and agricultural by-products that combine tremendous strength and flexibility while being 100 per cent compostable. Each brick can be made in five days from a mixture of microscopic fungus and corn stalks and husks. Is that it? A tiny amount of science and a student video? Hell, I could build a suspension bridge out of synthesised spider silk along those lines. But it wouldn’t work in the real world, would it? Of course, it will be great if there is a way to produce building blocks out of natural recyclable materials (clay, anyone?) that is both structurally capable and inert, but I guess this is a Show Me The Money moment. ok, but why post on the PP? I have just invented wattle and daub: you’ll see its the next big thing in building!! What is the point of a compostable building material? How can they say it uses no energy and that it’s self-assembling? The bricks don’t transport themselves and assemble themselves in place! And what is the point of the building in the video anyway? Just to create something temporary that will rot down to compost that you then have to cart away again? This is just utter twaddle! Typical of (some) architects’ total detachment from the real world! « Interested in neighbourhood planning?